An evening of infectious laughter; stunning magic; and the most fun you've had with duct tape and a blow torch. Described by MAGIC Magazine as "breath of fresh air" Marsh's blend of genuine warmth, wry humor, and stunning impossibility has been seen off-Broadway in New York City; on Women's Entertainment Television; and at private events at the Straz Center for Performing Arts, Walt Disney World Dolphin Resort, Hard Rock Casino, Millenium Hotel, the Gaylord Palms, and at finer hotels, convention centers, theaters and resorts throughout the United States. "I was absolutely blown away, and I am not an easy person to amaze or to please for that matter. I have seen a lot, and you are one of the best acts going on...creative, funny, entertaining, and clever"
"Nathan was spectacular! He was easy to work with, warm, friendly, and engaging. Plus his show was phenomenal! We completely enjoyed it." "Nathan wowed our audience consistently throughout his presentation! He was very easy to work with, dependable and professional. Our members are still talking about him." 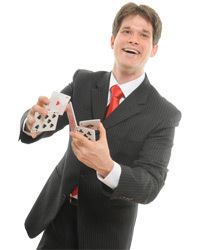 "Nathan is creative, entertaining and does a fantastic job of weaving our message into his attention getting magic act. Nathan's wit, humor and joy of life, as well as his work ethic, made him a great asset to our conference team and helped us have an outstanding conference. I have every expectation that we will hire him again in the future."